Heading: Sometimes is seems bizarre to me that we take dreaming in stride. [[Two people standing]] Person 1: Are you coming to dinner? 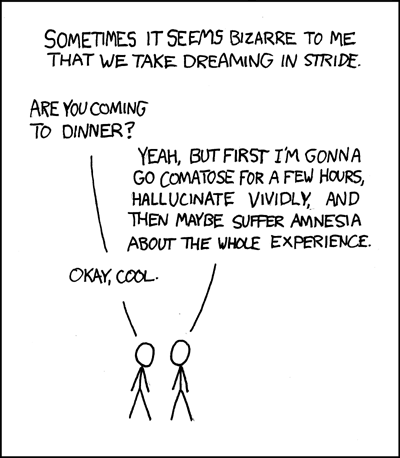 Person 2: Yeah, but first I'm gonna go comatose for a few hours, hallucinate vividly, and then maybe suffer amnesia about the whole experience. Person 1: Okay, cool.